This lovely Army Print Dog Bandana is one for the wild ones. When a dogs on sniff patrol, he'll need an army print bandana! Extra Large Neck Size 25-37 Inch. 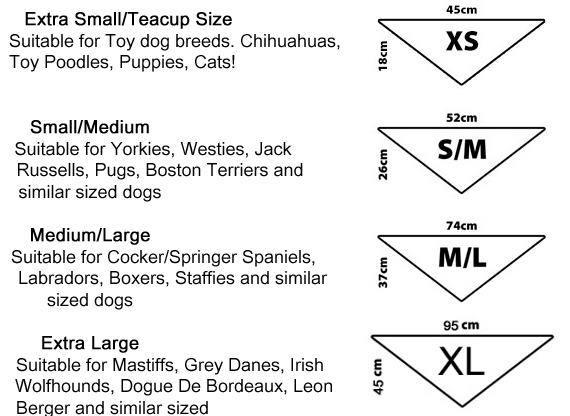 Suitable for Mastiffs, Irish Wolfhounds, Great Danes, Leonbergers and similar sized dogs. Our Army Prin dog bandanas do not have any buckles or fasteners. They are easy to fit and adjustable. Simply tie the bandana around your dog's neck to fit. If you find that the size you have ordered is a little too large, the top edge of the bandana can be folded before tying to get a better fit. Each dog bandana is handmade to order so please allow 3-5 days for delivery.